From previous Gift Idea posts you can see I'm a big fan of giving people skin care products as gifts. I always like to get people things that they'll actually use and enjoy using. 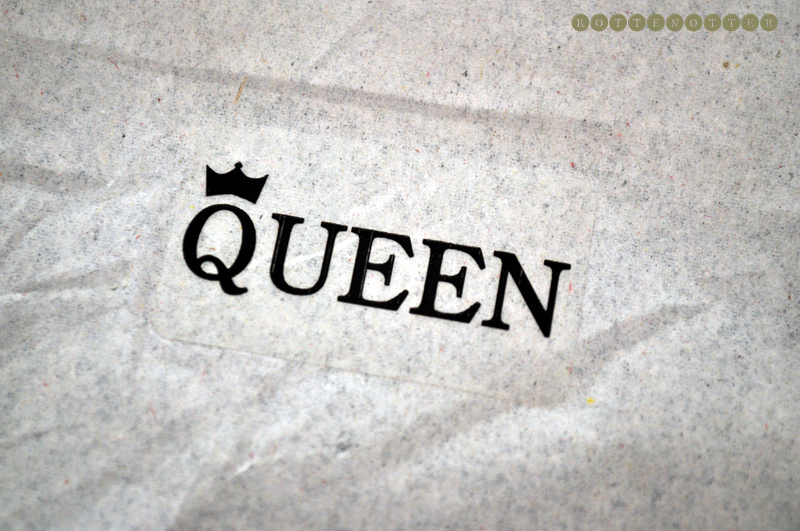 I've never heard of Queen Cosmetics before, although they have been going since 1927. They offer products for sensitive skin and are free of fragrance, perfume or essential oils. This means their products are perfect for people who suffer from skin conditions such as eczema, like I do. They have a great range of products too - skin care, body care, hair care and cosmetics. 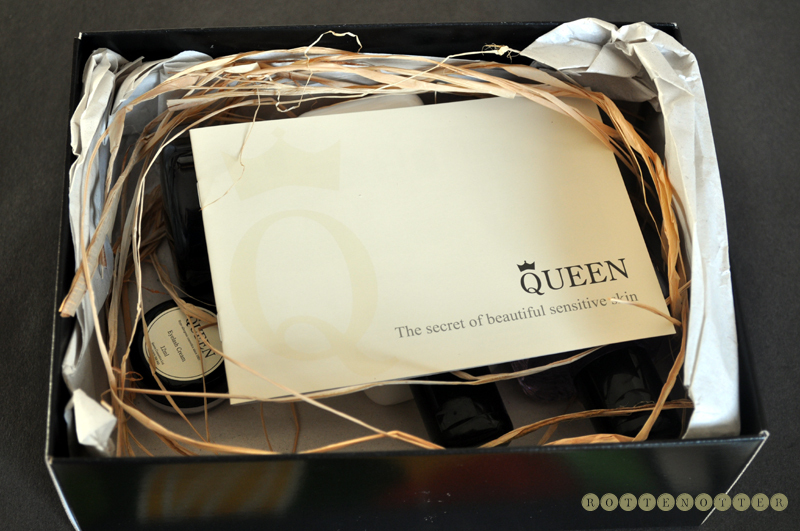 As Christmas is coming up, Queen are offering, at no extra cost, to gift wrap your chosen products and put them in their signature black box. As shown below in what I received. There is no limit on what you can add to, you could go for lot's of samples so your gift receiver can try a bit of everything. Or add one or two full sized products that you know they'll love. You can also adapt it to your budget. Today I have four* products from their skin care range to talk about. 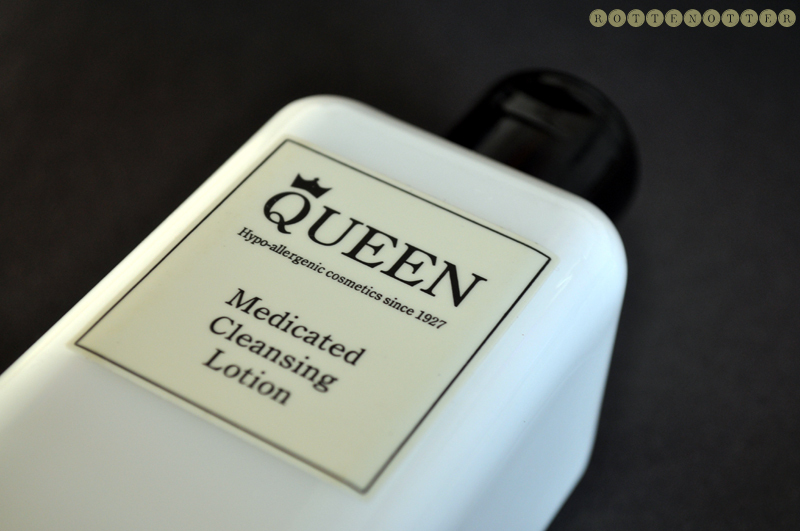 Medicated Cleansing Lotion - This is their best selling cleanser and is for normal, oily & combination skin. I have dry skin and this has been fine. It reminds me of the Cetaphil Cleanser in that it's really gentle, hasn't got a scent and just keeps the skin balanced. I apply this to onto dry skin and massage it in. I don't use this to take my eye make-up off though. Then I take a damp muslin cloth and buff all the product off. My skin is then left feeling clean and soft. It's available in two sizes which is great, the 250ml bottle, which I have, costs £15.25 and the 500ml bottle costs £23.45. Skin Fresher - I have to say, I don't always use toner when I wash my face. I tend to use it more in the summer and then I just get lazy in the winter and don't use it. I've been making an effort recently though to try and make it into my routine properly. I've decanted some of this into a spray bottle so in the mornings I'll spray a couple of pumps onto my face to try and wake me up after cleansing. Then in the evenings I'll use the bottle it comes with and pour some onto a cotton pad, then wipe all over my face. This gets rid of any left over make-up or grime. Like with all of these products from Queen, the toner doesn't have a scent so everyone's going to like it. I also really like the colour too, makes it a bit different and it looks nice in the bottle. The only thing I don't like about this toner, and will make me not purchase it, is that it contains alcohol. As I have quite dry skin on my face I find this dries it out more. If you have oily or normal skin you may not have this problem, this just isn't suited to my skin type. This 250ml bottle costs £15.25. 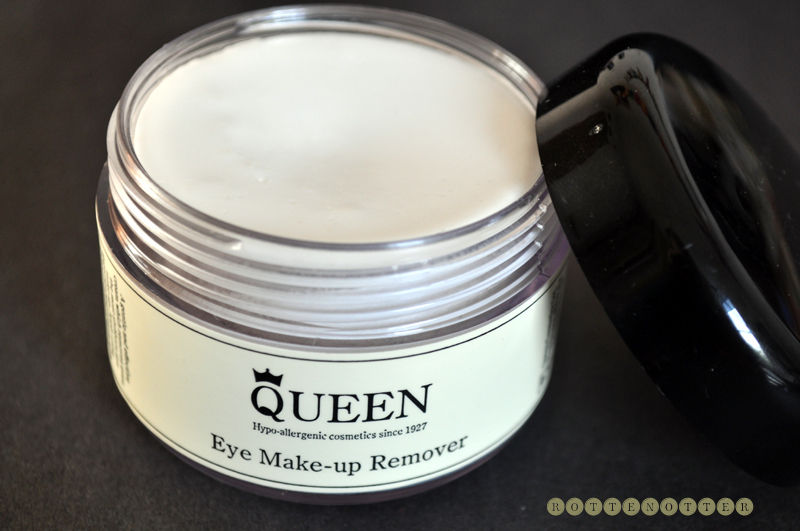 Eye Make-up Remover - When I think of eye make-up removers I always think of liquid, sometimes a lotion, but never a cream. This one by Queen is cream and I was really surprised and intrigued when I opened it. Immediately once you start applying this to your eyes, it just melts, making removal so much easier and nicer. A tiny amount will take off all eye products, even stubborn eyeliner or mascara. Once you start looking like you have panda eyes, I take one of my Liz Earle muslin cloths and run it under the hot tap. I then gently swipe away the mess and am left with bare eyes. I don't find any irritation like I have done with a lot of other eye make-up removers. I was really surprised at the price too, being only £14.50 for 50g. As I've only found two other eye make-up removers that I like, I'm happy with paying a bit more for them. This has now increased my list of good eye make-up removers to three. The other two being Liz Earle's Eye Bright and Mac's Pro Eye Make-up Remover. Eyelash Cream - This is a completely new product to me. I've haven't heard or tried anything similar before. 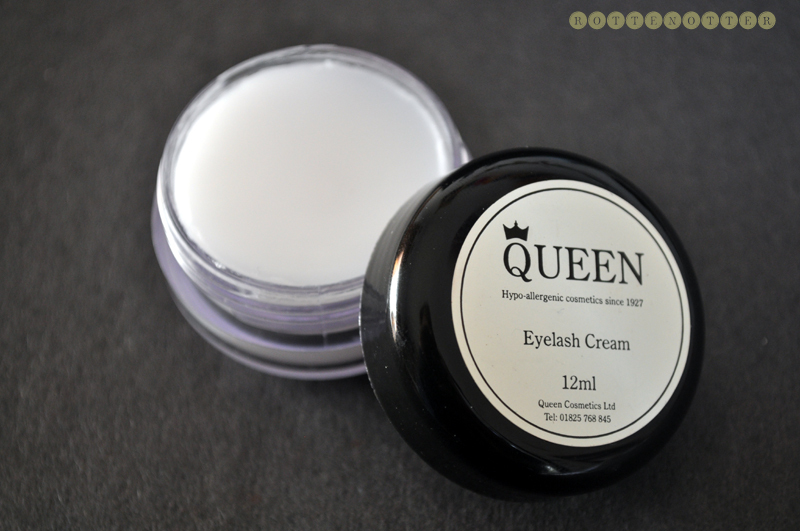 Queen Eyelash Cream is a unique and classic Queen product created back in the 1930s. It really is a tiny pot of wonder! It can be used when you don't want to wear mascara but want to define your lashes a little or, even better, for conditionning lashes to prevent dryness and breakages or to help repair dry, damaged lashes. Some of our customers also use it to keep eyebrows neat and glossy-looking. I've been applying this to my lashes after I take off my eye make-up at night. I haven't noticed any results yet, but I haven't been testing it long enough. I've also been applying this to my eyebrows through out the day to set them in place but also to keep them looking glossy and healthy. We put conditioner on our hair so why not our eyebrows?! Although this probably isn't necessary in everyone's skin care routines, it does make a nice little extra. This 12ml tub costs £9.70.